Note: Harco controllers are no longer being manufactured and ceased trading on 30/6/16 this page has been left for reference only. It comes with a digital lit display showing where in the firing the kiln is. With this model you can easily see what stage/Cycle you are on. It has 6/8 or 12 stages to each of its 8 programmable Steps. The stages are as follows. (1)UP, (2)SOAK or UP, (3)UP, (4)SOAK or UP, (5)DOWN, (6)SOAK. In these units the stages may be set to any configuration. (except that stage 1 must be an up stage). Recommended for specialised firings and glass forming, where extra soaks or a stepped down ramp is Required. Harco Programmable Temperature Controllers are an Australian designed and manufactured programmable kiln controller. Unlike most controllers, this one has been designed for use on Kilns, furnaces and ovens. It can be programmed to control the whole firing,including ramp rate,hold times and final temperature. CONE STYLE CUT OFF: The Harco unit can be set to turn off when the correct amount of heat/work has taken place as if a Ceramic cone had been set up. The Harco unit will either turn off at the preset Harco Cone number or Preset temperature depending on which it reaches first.Cone Shut off will help you from over firing your furnace. A LARGE 13mm (½”) DISPLAY WINDOW: All setting are made by push button and can be read on thelarge display window. When the kiln is firing the temperature in the kiln can be seen in this window. 8 -PRE-SETABLE PROGRAMS: The unit has 8 programmable programs, which will hold the information programmed into them even when the unit is turned off. These programs have UP and SOAK times that you can chose when you set your program. Each program can be changed as required even during firing. 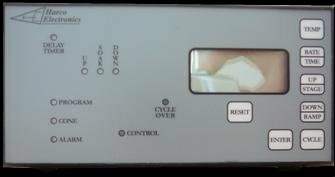 DELAY START TIMER: The start up can be set on a delay start timer so that the kiln will start up automatically so that it will be fitted into you particular firing schedule.